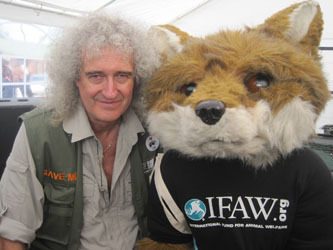 A cathedral full of Queen fans and animal welfare supporters can mean only one thing – an event staged by legendary rock guitarist and wildlife campaigner Brian May. The International Fund for Animal Welfare UK team was invited to take part in Brian’s ‘Wildlife Rocks’ event recently, in Guildford, Surrey. It was a great opportunity to join together with lots of other animal welfare groups to celebrate wildlife and make people aware of important animal welfare issues. Around 2,500 people of all ages attended Wildlife Rocks to find out more about animals while enjoying live music, readings and other entertainment. 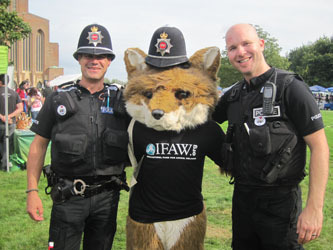 There was particular emphasis on British wildlife and some of the threats they face and IFAW took along its UK mascot, Freddie the Fox, to meet the public and help spread the message that we need to protect the ban on hunting with dogs to stop foxes, hares and deer from being chased and torn apart for so-called ‘sport’. 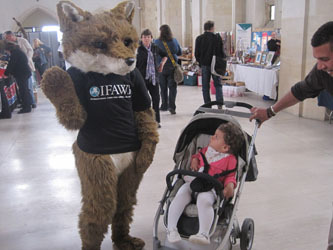 IFAW and other groups also used the opportunity to make members of the public aware of the imminent threat to another icon of British wildlife – the badger. Unless they receive a last-minute reprieve, around 70% of UK badgers could be cruelly shot in a cull aimed at reducing incidents of bovine TB in cattle. Such a cull would go against the views of the overwhelming majority of the UK public who wish to see British wildlife protected. A Guardian newspaper poll found more than 90% of people opposed to such slaughter and this was certainly evident in the conversations we had with concerned members of the public at the weekend. IFAW is horrified by plans to kill badgers in a cruel manner, based on scientific reasoning which we and others believe to be fundamentally flawed. We are very concerned that the proposed cull method, licensed free-shooting by farmers, has never been tested before and raises several serious animal welfare and conservation concerns. The cull would not be selective and healthy animals are likely to be killed unnecessarily; badgers may be injured or suffer slow, agonising deaths because they are killed by inexperienced shooters. More humane and efficient alternatives are available to address the problem, such as vaccination of badgers, which has been adopted as a solution in Wales. Eminent scientists and wildlife experts have stated their opposition to this proposed cull because it will not significantly reduce incidents of bovine TB. Many believe that rather than reducing the disease’s prevalence, culling badgers could actually help to spread it further. Elimination of badgers in one area will simply lead others to take over their territory, thus increasing the movements of badgers from one area to another. The use of non-professional shooters may also lead to injured or scared badgers fleeing their usual territory and potentially infecting new areas. There will be more news from IFAW soon on our work with Brian May and other groups to protect the British badger for future generations.